Remember that scene from Jurassic Park, where the raptor arrives in the big metal cage on a giant forklift, snarling and biting at the cage? That’s kind of what it’s like to receive an Origin desktop. The 2018 Origin Millennium arrived to us in a giant wooden shipping crate, chomping and snarling, just begging to be set free. It’s an appropriately dramatic arrival for a fully-loaded gaming desktop. The 2018 Origin Millennium packs an 8th-generation Intel Core i7-8700K processor, 16GB of RAM, a 512GB Samsung 960 Pro SSD, 6TB Western Digital Red hard drive, and not one but two Nvidia GeForce GTX 1080 Ti graphics cards running in SLI. All that powerful hardware is contained within a custom-built chassis clad in cherry-red aluminum and smoky tempered glass. Our review unit, as equipped, would run you $4,530. That’s a hefty price tag, but Origin has a track record of delivering killer high-end machines. Let’s find out if the Origin Millennium upholds that tradition. This thing is stunning, but getting to it is a bit of an adventure. After wrestling it out of a giant wooden shipping crate, like the one Indiana Jones used to seal away the Ark of the Covenant, you’ll need to un-sleeve the PC itself from a separate inner box. And finally, you’ll need to peel a slick, silky body glove off the glass-and-aluminum case, like unveiling a luxury car for the first time to an awestruck crowd. When you first lay eyes on the Origin, the struggle to free it from its wooden tomb is immediately justified. The default side panels include a aluminum panel for the right side, and smoked tempered glass on the left. If you’d like, you can order a second tempered glass panel ($75) or, if you think glass is too fragile, a second aluminum panel ($50). Both panels swing open on well-oiled hinges, like the glass door on a vintage Kenwood stereo system – the one you weren’t allowed to touch as a kid, but totally did anyway. The Millennium has a custom case exclusive to the Origin, and it’s been redesigned for 2018. The earlier model used plastic panels, which looked nice but felt flimsy. Those are now replaced with a (mostly) aluminum exterior, and available tempered glass side panels. It takes PC’s look and feel to a new level, and has advantages over a standard case. A desktop like the AVADirect Avant can offer identical hardware to the Origin Millennium, but it won’t look unique. With the Origin Millennium, though, there’s a level of detail that makes it feel like a luxury. Which is good, given the price. There’s a door on each side of the case, so the interior where your graphics cards resides, glowing softly, is just as accessible as the rear-side, where Origin’s cable management keeps the insides nice and clean. The interior lighting is subtle, but just present enough, with an LED strip along the back of the case and the top edge. The light strips are hidden by the tempered glass panel when it’s shut, allowing the light to diffuse throughout the interior of the case. Origin’s attention to detail has long been the company’s defining characteristic, and it evident here. Everything is meticulous. The company’s system builders don’t seem to have the words “good enough” in their vocabulary. There are a few other lights inside, from the G.Skill RAM, and the Asus ROG motherboard itself, but nothing overpowers or clashes with the customizable lighting from the LED strips. Like most desktops with interior lighting strips, the Origin ships with a remote control you can use to change the color, the pattern, and pulse or flash speed. Lighting can also be changed from the motherboard (depending on the motherboard you choose during configuration). As for utilitarian features, our Origin Millennium shipped with cherry-red aluminum side panel, in case you’re a little uncomfortable with having two tempered glass side panels, and want something a little more accidental-kick-resistant. On the backside of this desktop you’re not going to find any big surprises, as the I/O panel is exactly what you’d expect with a couple small exceptions. On the motherboard, there are seven USB ports, a DisplayPort, an HDMI port, and two coax plugs for the included Wi-Fi fin. Below the ethernet port, you’ll find the standard array of audio input and output jacks. Below that, where your two video cards offer up their DisplayPorts and HDMI ports, you’ll find something a bit peculiar but very welcome. Most of those plugs have plastic caps over them, preventing you from using them. The HDMI port on the top video card, the primary one you should plug your monitor or monitors into, is uncapped. It’s a small detail, but one that reminds you of the unique peculiarities dual-GPU systems have. Moving around to the front side of the Origin, you might try to open the red aluminum front plate, to find the power button. Inside, you’ll find only empty drive bays and locked quick-access bays for SSDs, but no frontal I/O or power button. That little guy is hidden under a plastic cap just above the red front plate. You’ll have to just slide it upward to reveal two extra USB ports, a USB-C port, and a couple audio jacks. Oh, and the power and reset buttons. Our only complaint here is that the plastic cap which hides the front-side I/O pops off a little easily, and doesn’t slide upward very smoothly. It’s the one part of Origin’s custom case that feels half-baked. For a system so chock-full of powerful hardware, the interior is remarkably open and airy. The layout is clearly designed to look clean, but that cleanliness serves an important purpose. Cable management is simple, precise, and most importantly, it makes sense. Everything is placed with purpose, and zip ties keep cables out of the way, bundled together without obstructing the view. Beneath the right panel, where cables can traditionally get a little messy, the Origin Millennium keeps things neat and tidy. Cables are bundled together and snaked through from the front side without getting twisted, tangled, or losing their clarity of purpose. Open the back for the first time, and it’s easy to see what goes where and why. It all makes sense, which makes your job a little easier when it comes time to upgrade. Origin’s proprietary Frostbyte 360 liquid cooling system keeps system noise to a minimum. Even the removable dust filters on the top and front interior of the case are tucked away out of sight, without limiting their accessibility. The top filter just pops off, and the front filter can be removed and replaced by opening the tempered glass side-door. Moving on to the more utilitarian aspects, the Millennium has Origin’s proprietary Frostbyte 360 liquid cooling system, and it does an excellent job of keeping system noise down. Even under heavy load, the Origin is never too loud – though it does get noticeably noisier when you’re running a game at 4K resolution. The power supply and its cables are partitioned off from the rest of the case, tucked away inside a metal enclosure which is a bit tricky to access or remove, but given the power supply’s size, 850 watts, it probably won’t need replacement any time soon. Still, the metal partition breaks Origin’s promise of “tool-free upgrades. To access the partition you’ll need a screwdriver, and a little patience. Otherwise, the liquid cooling, cable management, and fan placement all make for an exceptionally well-designed interior. The processor is one of the first components you’re likely to notice on the Origin Millennium’s spec sheet. It’s the Intel Core i7-8700K, an unlocked, 8th-generation processor with six cores and 12 processing threads. Let’s skip the preamble and get right into the question on everyone’s mind: Is the 8th-generation Core i7 that much faster than a 7th-generation Core i7? Yes, and no — our results are a bit mixed. Let’s get into it. Looking at Geekbench scores, you can see that the i7-8700K is a very quick processor, but its greatest strength is its multi-core performance. The AVADirect Avant and Origin Neuron, both of which featured the Intel Core i7-7700K processor, are still top-performers. The Origin Neuron’s processor — likely due to a superior cooling setup — comes in ahead of the AVADirect Avant, and just a hair ahead of the Origin Millennium in single-core performance. That lead absolutely crumbles beneath the Millennium’s multi-core performance though, in which the Millennium outperforms the Neuron and the Avant by a substantial margin. The Core i7-8700K’s two additional cores make their presence known. That lead widens to a significant win in our real-world test, a 4K transcode conducted with Handbrake. We had each one of these processors crunch the same trailer of Elysium, and the results illustrate the real strength of the i7-8700K. The Origin Millennium finished the encode in just over three minutes, shaving over a minute and a half from the best times we saw from the AVADirect Avant and Origin Neuron. It’s an impressive margin, and it proves the new Millennium can handle anything you throw at it. 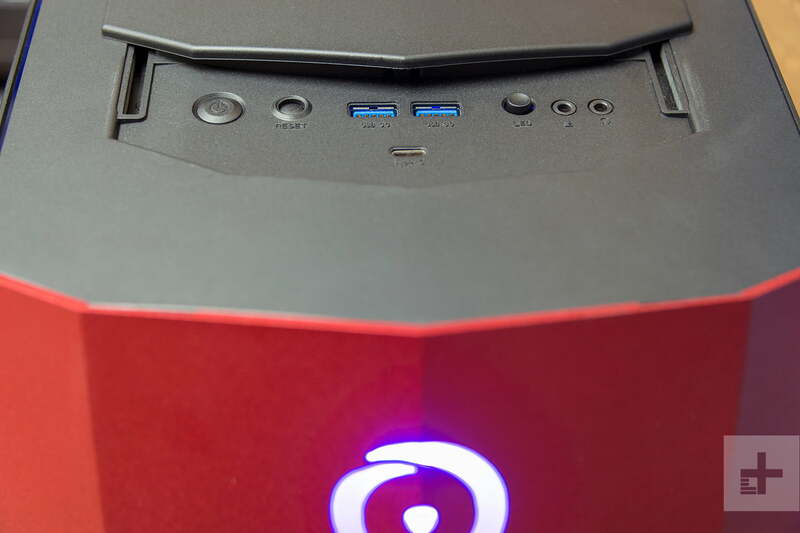 The Origin Millennium, as a premium gaming desktop, features two hard drives. One is a lightning quick 512GB Samsung 960 Pro SSD, the other is a much slower, but much larger, 6TB Western Digital Red hard drive. It’s worth mentioning that during everyday use, these two drives might seem a bit quicker than they really are thanks to some software wizardry. The Origin Millennium ships with RAM caching software, which essentially uses your RAM like a super-fast SSD to temporarily cache files. Turning it off reveals the Millennium’s true drive speeds, which are still quick, but not nearly as quick as they appear to be with the RAM caching software enabled. When it comes to actual speed, we have a split result here. The Origin Millennium possesses the quickest read speed, with its Samsung 960 Pro SSD coming in at 2,753 megabytes-per-second to the AVADirect’s 2,013 Mb/s, and the Origin Neuron’s 2,557 Mb/s. On write speed, the Millennium falls just a bit behind the Neuron, but both remain well ahead of the AVADirect Avant. The Origin Neuron hit 1,987 Mb/s, and the Millennium topped out at 1,972 Mb/s, while the AVADirect Avant came in at a quick, but not super-quick 1,414 Mb/s. With speeds this quick, though, you’re likely going to be satisfied with any of the desktops we’ve recently reviewed. They’ll all load files, and games, with incredible speed. It’s pretty hard to find systems that can stand up to the Origin Millennium’s graphical setup, since it features not one but two of, arguably, the quickest consumer graphics cards on the market — the Nvidia GeForce GTX 1080 Ti. Luckily for us, the AVADirect Avant and Origin Neuron were both tested with dual-1080 Ti setups, so this will be as fair a fight as we can make it. Let’s see how these heavyweights stack up. Starting off with 3D Mark, we can get an idea for where these systems all stand in relation to one another with some impartial numbers. Looking at Fire Strike scores, the AVADirect Avant comes in third with an impressive score of 28,083. The Origin Neuron hits 30,051, which is pretty high for plain-old Fire Strike, but the Origin Millennium surpasses it by a fair margin, achieving a score of 33,584. These are the same standings we see in Time Spy, a more demanding benchmark, with the AVADirect Avant coming in at 13,853 to the Origin Neuron’s 15,227, and the Millennium’s 16,776. Moving on to some real-world tests, things are a bit less cut-and-dried. It shouldn’t come as a surprise that the Origin Millennium just obliterates our 1080p benchmarks. After all, a dual-1080 Ti setup is a bit overkill for humble 1080p, where even mid-range systems can hit high framerates without too much difficulty. The AVADirect Avant and Origin Neuron also make short work of our benchmarks here, achieving impressive scores across the board — even surpassing the Origin Millennium in a few games. The Origin Millennium is a stellar gaming desktop. It matches or beats its closest competition in pretty much every category. That part isn’t too big a shock either. These systems might have the same graphics card setup, but their hardware differs pretty wildly. The AVADirect Avant, for instance featured 64GB of RAM, and the Neuron featured 32GB of RAM, and both featured overclocked processors. Those differences alone likely account for some of the variation we see here. For instance, in Civilization VI, we see the Origin Neuron fall behind, with the AVADirect Avant and Origin Millennium neck-and-neck. The Millennium pushes ahead by a bit, but in Civilization VI you’re not going to notice an extra couple FPS. Our Battlefield 1 results came in along similar lines, but with the Origin Millennium and Neuron coming in very close to each other at the Ultra detail setting. The Millennium hit 189 FPS, and the Neuron topped out at 186 FPS, while the AVADirect Avant fell behind, with 167 FPS. In For Honor the variation becomes more pronounced, with the Origin Neuron achieving the highest framerates at Medium and Extreme detail settings. In both cases, the AVADirect comes in a close third to the Origin Millennium’s second place. Predictably, we saw performance fall a bit as we upped the challenge, cranking the settings up to 1440p. In Civilization VI, the AVADirect Avant actually comes in first, with 97 FPS. The Neuron hit 81 FPS, and the Origin Millennium capped out at 93 FPS at the Ultra detail preset. In Battlefield 1, the Origin Millennium beat the competition by a sizable margin, coming in with an average of 167 FPS, to the Origin Neuron’s 133, and the AVADirect Avant’s 143. That’s an important thing to note because it means you can run Battlefield 1 on a 1440p monitor quick enough to make the most of high refresh rate display (like one of those fancy 144Hz gaming monitors). All three of our contenders here pushed past that margin in For Honor at the Extreme detail preset. The AVADirect Avant managed an average 150 FPS, and the Origin Neuron hit 210 FPS, while the Origin Millennium achieved an average framerate of 190 FPS. So pretty much no matter what, if you have two GTX 1080 Ti graphics cards in your desktop, you’re going to be able to run very demanding games at high framerates — typically high enough to run your games at 1440p and 144Hz without any difficulty. Running games in 4K however, is a different story. Remember just a paragraph ago when we were talking about how quick the Origin Millennium was at running Battlefield 1 on the Ultra detail preset? Well, at 4K the Millennium barely managed 107 FPS, which means its performance dropped by almost a third just by moving the settings up to 4K. To be fair, the Millennium is powerful enough to run most games at max settings in 4K, but you’re going to see some significant loss in your overall performance. Your game will look better on that 4K monitor, but you’ll need to settle for a 60Hz refresh rate, instead of 120Hz or 144Hz. There are a number of other apps which come preinstalled, but nothing obtrusive. The Origin Millennium doesn’t ship with a forcibly installed trial copy of McAfee Antivirus. That alone is worth noting, because it means you won’t need to pop open your control panel and rip that thing out, root and stem, before you get to enjoy your new gaming rig. There are a number of other apps which come preinstalled, but nothing obtrusive, and certainly nothing that requires immediate emergency surgery to remove. The included Asus ROG software makes it easy enough to keep an eye on your system status, adjust your overclock, or just keep an eye on internal temperatures – which tend to stay nice and cool even during heavy use. The Origin Millennium ships with lifetime 24/7 U.S. based support, lifetime free labor, and one-year part replacement coverage, with a 45-day shipping warranty against any damage the Millennium may have suffered on in transit. The Origin Millennium is a stellar gaming desktop. It matches or beats its closest competition in pretty much every category. But let’s be honest, at $4,530 it absolutely should be a killer gaming PC. Ordering one of these, you’re going to end up with a powerful gaming rig that can make short work of even the most demanding games. The question is, should you buy the Millennium over the competition? By their nature gaming desktops are highly customizable, so you could always just re-build any given gaming desktop at another manufacturer’s website and maybe save a few bucks. However, when you’re comparing desktops which all come in at around $4,000, every little detail counts. Our Origin Millennium review unit was priced at $4,530 as-tested. The Origin Neuron comes in at $4,200, and the AVADirect Avant is $3,850. Even though the Neuron and Avant are a bit cheaper, and both feature more RAM than the Millennium, neither one had an 8th-generation Intel Core i7 processor, or a completely custom-built chassis like the Millennium. While you can get very similar performance out of a slightly cheaper desktop, there really isn’t a better alternative if you’re looking for a top-end gaming desktop with a custom enclosure and bleeding-edge performance. The Origin Millennium is built to last — maybe not exactly for 1,000 years, but it’ll see you through more than a few hardware generations. With two GTX 1080 Ti graphics cards, and an 8th-generation Intel Core i7 processor, you’re not going to feel this thing slow down any time soon. You might want to add some more RAM in the next couple years, but other than that, this thing is going to outlast most of the other electronic devices in your life. If you’re in the market for a gaming desktop, and you have enough room in your budget for a $4,530 gaming PC, then you should absolutely buy the Origin Millennium. The Origin Millennium is excellent in every way a gaming desktop should be.